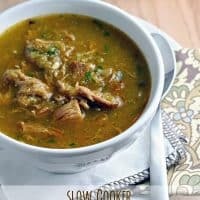 SLOW COOKER PORK CHILI VERDE — Tender pork, slow cooked in a spicy chili verde sauce. Delicious on it’s own, or served with warm tortillas and a dollop of sour cream. I’ve been wanting to make my own pork chili verde for a long time. But all the recipes I’ve come across seemed so complicated….requiring me to roast peppers and tomatillos and put in all kinds of time and effort. 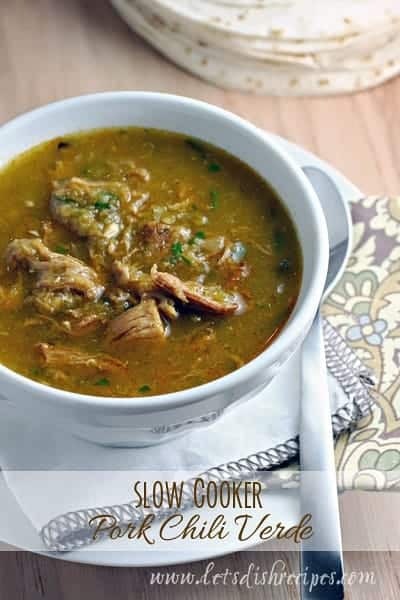 Until I discovered this Slow Cooker Pork Chili Verde! I figured there must be a way to make a great chili verde without all that work. The secret, I think, is in searing the pork before placing it in the slow cooker, then cooking the vegetables in the same pan. 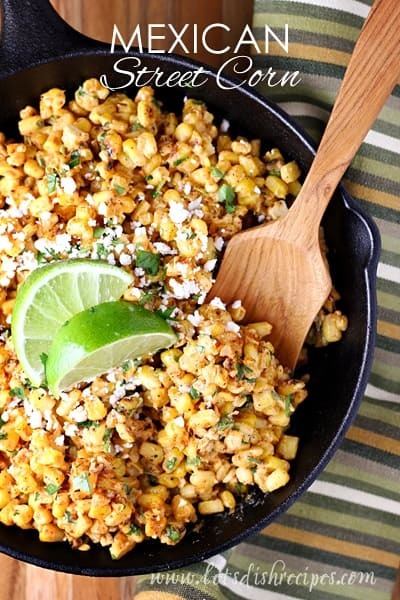 It gives this dish a great depth of flavor, but isn’t as time consuming as all that roasting. And let me tell you, this stuff is amazing! Like, I would choose it for my last meal kind of amazing–especially served up with some sour cream and cheese. And with warm tortillas for dipping–knock your socks off good! My family wholeheartedly agrees. No one ever complains that the recipe makes enough to feed us for two days. Tender pork, slow cooked in a spicy chili verde sauce. Delicious on it's own, or served with warm tortillas and a dollop of sour cream. Heat 1-2 tablespoons olive oil in a large skillet over medium-high heat. Cut pork tenderloin into 2 or 3 large chunks and season generously with salt and pepper. Place pork in hot oil and sear on all sides until well browned. Remove pork and place in slow cooker. Add onion, Anaheim pepper and garlic to the skillet (adding more olive oil if necessary) and cook for 3-5 minutes, stirring to remove any browned bits from the bottom of the pan. Add pepper and onion mixture to the slow cooker with the pork. Cover with chicken broth and cook on high for 3-4 hours, or until pork is tender. Meanwhile, puree the 2 cans of green chilies, with juice, in a food processor or blender (you may have to puree one can at a time). Stir the flour, green enchilada sauce, Tabasco, 1 teaspoon salt, 1/2 teaspoon pepper, chili powder, cumin and oregano into to the pureed chilies. Cover and refrigerate until ready to use. Remove pork from slow cooker and shred. Return to slow cooker, along with pureed pepper mixture and cilantro. Cook on low for another 3-5 hours. 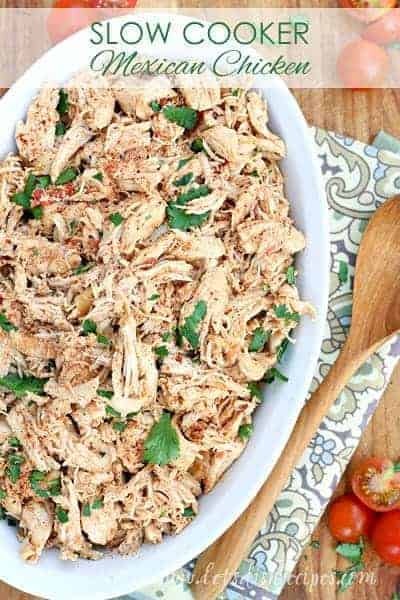 Serve with sour cream, shredded cheese and tortillas. Oh that looks SO yummy! I love following you and using your recipes:) Have a blessed weekend, HUGS! Looks great. My husband will love this one! Thank you soooo much for the recipe. I’ll defnitely spread the word. If your interested in more recipes link to http://www.crockpotking.com. Thank again for the wonderful recipe!!! Marilynn my family of five (all boys but me) can eat it for two days, so if you serve it with some tortillas and/or chips I think you will have plenty. Chili Verde is one of my favorite foods, and this recipe is very good. However, it was quite expensive to make with the large pork loin and large cans of whole green chilis. Good thing it ended up being making enough for a couple of meals for my husband and I! Next time, I think we’ll just go out and skip all the cooking! Thank you for another amazing recipe. 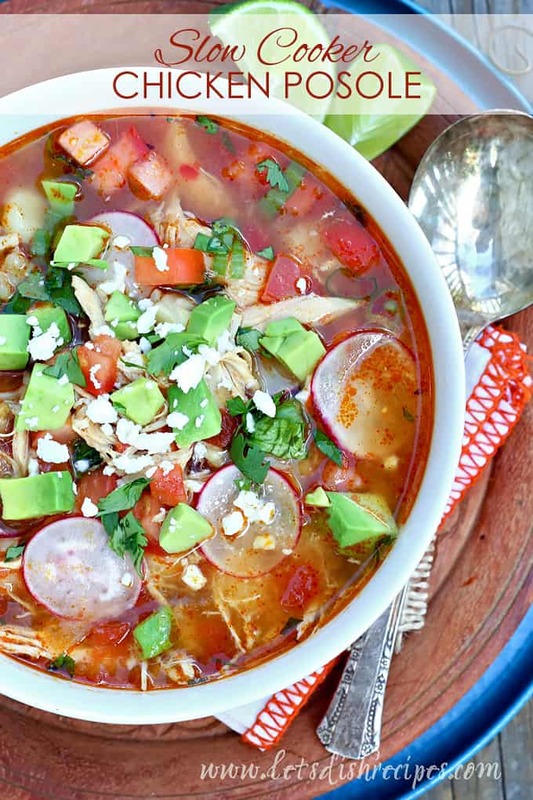 I have tried several pork chili verde recipes and none have been quite right until this one!!!! Perfect. Would a pork loin work as well? I have one in my freezer so would love to use it but didn’t know if would be as tender. Thanks! Sorry – one last question….The only 27 ounce green chilis I know of are the Hatch green chilis. What brand did you use and are the little 4 or 7 ounce cans you get the same flavor? Thanks! So excited to try this. I use the large Hatch cans. We don’t eat pork. Can I substitute the pork for chicken? If so what cut of chicken can I use? You could use chicken. I think whatever cut you prefer is fine. Great recipe! The pork is cooking as i type. Did you save the liquid you cooked the pork in and use it as a base for the chili our did you discard it and just use the chilis that you blended in the food processor? I leave the liquid from cooking the pork in the slow cooker, then add the blended chilis to that. This recipe was amazing! It was as close to an authentic as this AZ girl had seen. Thank you! I made this today with some small tweaks. It was really, really delicious and easy. Thank you!! Hi just thought that the green chili sauce was too much to add to my slow cooker I had to remove some of the chicken broth mixture in order to have enough room to add half of thegreen chili sauce. Very tasty though! It’s just not spicy enough like you would expect from all the chili smells. Plus it’s a little acidic, what can I do next time to solve these problems? Don’t want to add more salt because I’m afraid of over salting but if I could do it safely I will, so what would you suggest?